"Big Islanders are invited to activities Saturday in Waikoloa in observance of the first Wildfire Community Preparedness Day focused on reducing the risk of wildfire damage in Hawaii by encouraging community volunteers, neighborhoods and individual homeowners to join forces in creating safer places to live. State Farm, the National Fire Protection Association and Fire Adapted Communities are cosponsoring the event. From 9 a.m.-2:30 p.m., there will be volunteer gardening and wildfire workshops, field tours and lots of info and tips, plus Smokey the Bear, at the Dryland Safety Park in Waikoloa Village, said coordinator Pablo Beimler, of the Hawaii Wildfire Management Organization (HWMO), a nonprofit organization dedicated to protecting communities and natural resources from the devastating effects of wildfire. 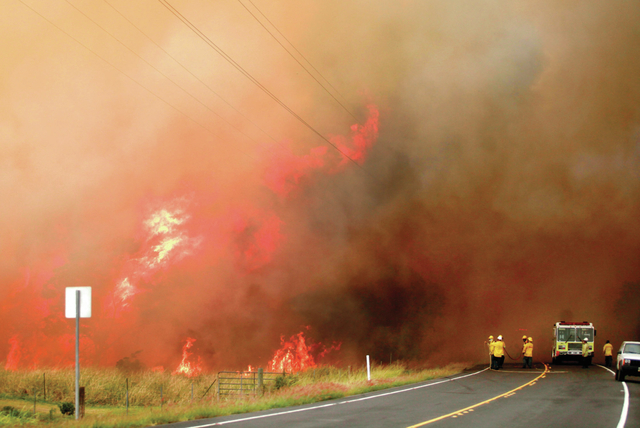 For more information, visit www.hawaiiwildfire.org, email Beimler at pablo@hawaiiwildfire.org, or call 885-0900. On Wildfire Preparedness Day, communities across the nation are rallying to host a variety of events to help raise wildfire awareness, promote collaboration and bring neighbors together to work on projects that protect homes, neighborhoods and entire communities. At HWMO headquarters in Waimea, volunteers recently received 10,000 copies of the first-ever Hawaii version of the 'Ready, Set, Go! Wildland Fire Action Guide.'"